Samuel F. B. Morse's Telegraph Key. Courtesy of the University of California, Berkeley. Image available on the Internet and included in accordance with Title 17 U.S.C. Section 107. Telegraph Lines near Love Field airport, Dallas, 1918. Courtesy of the University of Texas at Dallas and the Portal to Texas History. Image available on the Internet and included in accordance with Title 17 U.S.C. Section 107. Western Union Telegraph and Cable Office in Denison, circa 1920. Image available on the Internet and included in accordance with Title 17 U.S.C. Section 107. TELEGRAPH SERVICE. In 1838 the Republic of Texas failed to accept an offer from Samuel F. B. Morse to give his new invention to that new nation. Morse, receiving no reply to his offer, withdrew it in a letter to Governor Sam Houston in 1860. His model instrument is kept in the State Archives Building at Austin. The use of the telegraph for communication in Texas, which preceded the railroads and telephone as a national network, began with the chartering of the Texas and Red River Telegraph Company on January 5, 1854. The first telegraph office was opened by the company in Marshall on February 14, 1854. Patrons were offered connections with New Orleans via Shreveport and with Alexandria, Louisiana, and Natchez, Mississippi. The same year the line was extended to Henderson, Rusk, Crockett, Montgomery, Houston, and Galveston. Wires were strung from treetop to treetop, and in many instances telegraph operators closed the offices and rode along the lines to make repairs when the wind swaying the trees caused breaks in the wires. On January 15, 1856, the Texas and New Orleans Telegraph Company was chartered and began construction of lines from Galveston to San Antonio and Austin, but it was 1862 before Austin had direct connection to New Orleans. These first two telegraph companies later consolidated their interests. The line completed between Galveston and Houston along the Galveston, Harrisburg and Houston Railway in 1860 is described as the first permanent telegraph line and first railway telegraph line in Texas. South-Western Telegraph Company, which purchased and extended the line from Galveston to New Orleans, was later consolidated with the American Telegraph Company and was subsequently absorbed by Western Union Telegraph Company, which began operating in Texas in 1866. By 1870 there was an estimated 1,500 miles of telegraph wire in Texas, and in 1874 Western Union owned eighty-nine of the 105 telegraph offices statewide. At the time telegrams cost a quarter for distances under twenty-five miles. Expansion was rapid up to 1890 as the transcontinental railroads completed lines across the state. A military telegraph linking the San Antonio posts with other army reservations was completed in 1876. The Galveston News was the first Texas newspaper to use the telegraph, using a special leased wire between Galveston and Dallas by October 1, 1885. Western Union became the only company operating in the state after its merger with Postal Telegraph and Cable Company on October 3, 1943, and by early 1949 employed 2,802 people and operated 1,828 offices in Texas. 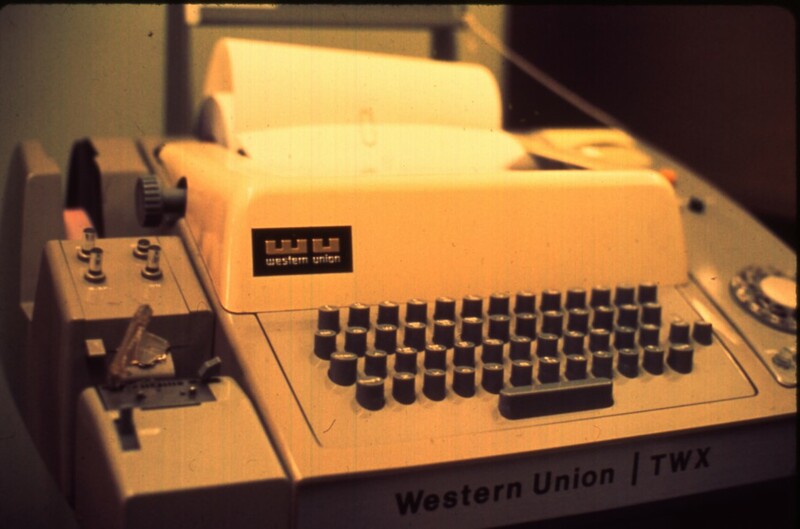 Western Union Telex. Courtesy of the Western Union Telegraph Company. Image available on the Internet and included in accordance with Title 17 U.S.C. Section 107. 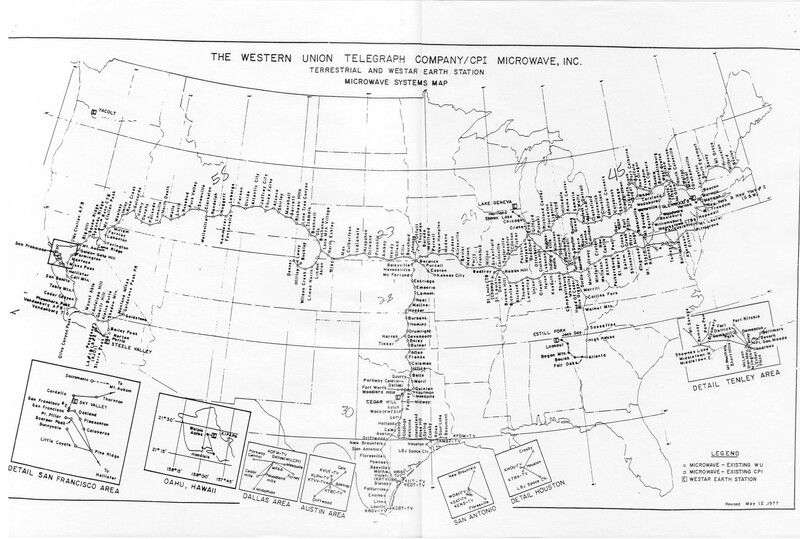 Western Union Microwave Systems Map, 1977. Image available on the Internet and included in accordance with Title 17 U.S.C. Section 107. Western Union remained the only telegraph company in Texas after 1943, and advances made it one of the most modern telecommunications companies in the world. 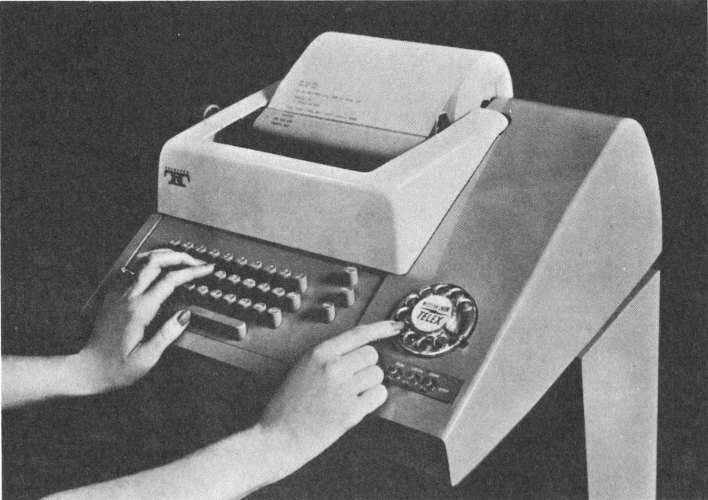 In the early 1960s ten major Texas cities and their surrounding communities were served by Western Union Telex, a direct-dial teleprinter exchange service, which established automatic connections between subscribers in eight seconds or less, regardless of distance. A large number of additional Texas cities were added to the Telex network in 1966 and 1967. Telex subscribers throughout the state maintained record and data communications with other subscribers throughout the United States and reached a hundred other countries around the world through international carriers. Western Union's broadband exchange service allowed subscribers to select broadband channels by push-button telephone for the automatic exchange of data, facsimile, and voice communications. Inaugurated in the fall of 1964, broadband exchange service initially was available in the Dallas and Houston areas for connection to subscribers in twenty-three other large cities from coast to coast. Also in the fall of 1964 Western Union inaugurated a new $80 million transcontinental microwave network with a main trunk running into Texas. The new advanced-design system was capable of handling all forms of electronic communication, including high-speed facsimile, data, telegraph, voice, and Telex services. Total capacity of the microwave beam system was 7,000 voice channels. It was initially equipped to provide 600 voice bands, which would add a basic capacity of more than 80 million telegraph channel miles, or more than fifteen times the company's existing channel mileage. Telegraph Park, the site of the first telegraph office in Marshall. Image available on the Internet and included in accordance with Title 17 U.S.C. Section 107. Western Union TWX Machine. Courtesy of the Nebraska Library Commission. Image available on the Internet and included in accordance with Title 17 U.S.C. Section 107. On June 29, 1970, Western Union opened a National Processing Center in Dallas to receive and process accounting and payroll data from offices nationwide. 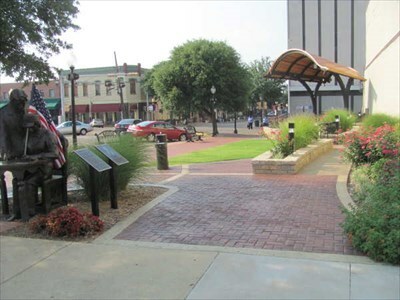 On February 9, 1972, as part of its decision to close many small local offices around the country, the company closed the first telegraph office in Texas at Marshall, which had been in operation since February 14, 1854. Installation of a communications computer at Austin for the General Service Administration in 1973 increased Western Union's nationwide data transmission system, and in 1974 the company launched the nation's first domestic communications satellite. One of the initial ground receiving stations for satellite transmissions was located at Cedar Hill near Dallas. By 1975 Western Union's nationwide microwave system extended into Texas with terminals at Dallas, Houston, Beaumont, San Antonio, Corpus Christi, and Austin. Dallas and Houston served as major exchange switching hubs for the firm's dial-up Telex and TWX services. Telegraph service throughout the state was fully computerized, with all offices transmitting telegrams directly to the computer center at Middletown, Virginia. Over 8 percent of Western Union's Telex and TWX subscribers were located in Texas. The company's Dallas Area Headquarters (one of thirteen) managed sales, technical, and public office operations in Texas and Louisiana. Services in addition to telegrams and telegraphic money orders included: mailgrams (electronic mail), point-to-point voice data service via satellite and microwave, data communications services including Telex, TWX, Info-Cam, DataCom, Sicom, Broadband, and Hot-Line and SpaceTel telephone service. State revenues from telegraph taxes totaled a high of $382,848 in 1984. Robert Luther Thompson, Wiring a Continent: The History of the Telegraph Industry in the United States, 1832–1866 (Princeton University Press, 1947). Handbook of Texas Online, Curtis Bishop and L. R. Wilcox, "TELEGRAPH SERVICE," accessed April 18, 2019, http://www.tshaonline.org/handbook/online/articles/egt01.